You’d imagine the Taj Mahal to be a glistening white but it’s actually a nicotine-ish yellow as you can see here. This could be the natural marble or it could be pollution. Fairytale: a story (as for children) involving fantastic forces and beings (as fairies, wizards, and goblins). Even though there are things we want to see in India we still refuse to set the alarm clock. I woke up around 11am, the relentless noise of Vrindavan invading our room. I’m sure that yesterday when we checked into this “hotel” there were no auto or cycle rickshaws parked outside, now there is a pack of them waiting on the doorstep. We just took the nearest and told him we wanted to go to Agra, we didn’t want to argue about the fare, starting the engine he was laughing and made sure all of the other drivers could see that he had us. Are we some sort of trophy or just two wide eyed tourists easy to rip off? I remember when we arrived at Mathura Junction yesterday we were shocked to see the queue in the main hall trying to buy tickets, the proportions were biblical, so I told the driver we wanted to go by bus. He took us to Mathura Old Bus Station where a group of men told us there were no buses going to Agra. An older man got quite angry with his friends and told us there was, he pointed to an old battered, blue bus with bars on the windows and told us that is what we were looking for. The journey to Agra was so cool, looking out of the window at the passing landscapes made me feel so happy just to be in India, like one of my dreams had come true. Every now and then a speckless bus with glass windows and no doubt airconditioning would overtake our old battered bus, full of western tourists and I felt so grateful that we were in our regional bus with real Indians. While a man who spoke very good English was showing boyfriend photos of the Taj Mahal from his mobile phone I kept reminding myself not to touch the chair infront of me, I think someone had spat some sort of red seed onto it. We arrived at Agra bus station only to realise we were 14km from the Taj Mahal so we took what might have been a tempo (a shared auto rickshaw). We could hear thunder and see torrential rain and some of the streets were flooded, I could see the driver trying to work out how to get to Taj Ganj (the neighbourhood of the Taj Mahal) and all I could do was laugh, thinking nature was playing a game “If you try hard enough then i’ll let you see the Taj Mahal.” Then, in the flood the driver pointed to the horizon and said “Taj Mahal” and there, through the grey skies and mist from the rain I could see the silhouette of the dome and felt a rush of emotions. The driver dropped us off at the security barrier where we walked down to the west gate. Some guides offered to show us around but we declined, I already knew the non-romanticized truth about Shahjahan which I would tell to my boyfriend as we wandered around. I had his cigarettes in my bag (I don’t smoke myself) and when the woman security guard who was rummaging through bags saw Marlboro she confiscated them, slightly disgusted as if she had just learned that women sometimes smoke. We walked across the red stone of the complex and then suddenly through a gate we spotted the mausoleum at the end of the Lotus Pool. I’ve been to many places across the world and noticed that you can visit a place on a grey afternoon and hate it and then visit again at the height of summer and love it, but this was different. 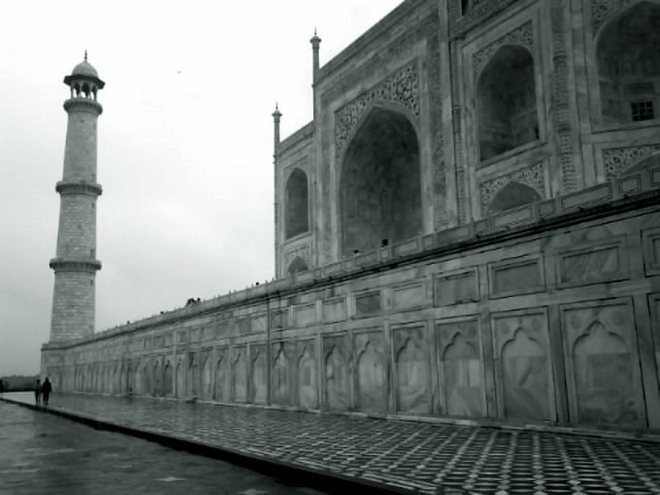 Against the grey sky the Taj Mahal was brilliant and dignified and awe inspiring. For me, the ultimate, the serene. As we got closer what seemed like an illusion, the building got more distant and mystical until we reached the end of the uneven red stone we had been walking on. Stepping onto the effortless white marble in one flash, in my mind, I had been transformed into a Lilliputian, stepping onto the frosted icing of the world’s largest and most fantastic wedding cake. The last time I had truly looked up in wonder at something was, as a teenager, standing between the two towers of the World Trade Center in Manhattan and now I became aware that India was seizing all of the absolute within my mind, taking the crowns for itself and I didn’t want it to stop. The tomb chamber was dark and claustrophobic which only heightened the contrast and wandering around I was reminded that I still was in the modern age, the grafitti and love hearts and names scribbled onto the walls. It had began to rain, torrential rain and I didn’t care, with no umbrella we explored the complex, clothes soaked to the skin, we were shocked that we only saw a handful of westerners, the garden packed with tourists from all over the sub-continent. We let the people, who didn’t attempt any small talk, photograph us when they asked and just before leaving my boyfriend and I turned around to take one last look, to absorb the final moment, hugging each other, knowing that this would be a moment, timeless within itself. 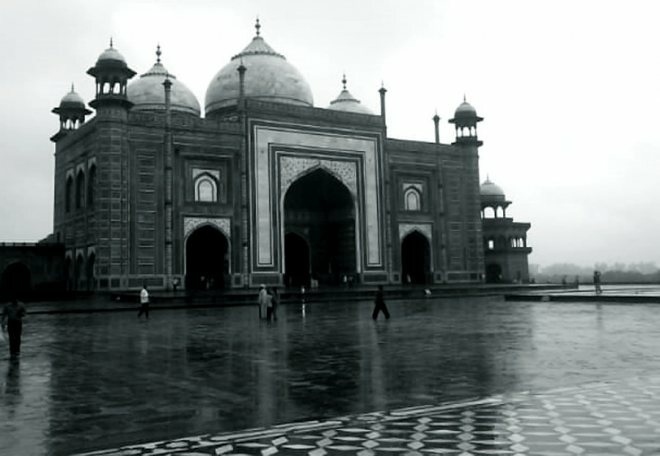 The Taj Mahal is surrounded by equally beautiful, if less dramatic, buildings. Leaving Agra, with the warnings the harrassed American girl had told us in Paharganj about Agra’s bag snatchers and crimewave we decided to head back to the bus station only to be told there are four bus stations!! We didn’t know the name of the bus station but a auto rickshaw driver promised to get us on a bus, he took us to a part of Agra we hadn’t passed through and waved down a bus which was heading to Mathura. We headed back along the highway, I used the air from the open window to dry my drenched hair. At one point we saw a yellow fence with spikes seperating the lanes of the highway. It was pouring down and at the exact moment our bus stopped in a traffic jam right outside our window was a young man, maybe about twenty and out of it on drugs or alcohol climbing on the fence. Just as I was thinking “he shouldn’t be climbing there, it’s too slippery” he lost his grip and one of the spikes went through his chest. I screamed and the woman in front of me turned to see what was going on, and when she saw what was happening she looked mortified so I guess for Indians (who seemed to never get freaked out about anything) on the scale of one to ten this must have been pretty bad. Just as the mans eyes were rolling back the bus moved on – we saw at least two trucks that had crashed along the way and one which had just toppled over. In my mind I could see the Earth rotating and while looking closer at India the country was being shaken by a massive earthquake – that is how it feels to be in India. Turbulent. Rather naively we assumed we knew all there is to know about getting from Mathura to Vrindavan. We stood beside a road which went under a railway viaduct, it was flooded waist high and I became aware that no matter how rich or poor, nice clothes or not, we are all the same. Everyone was forced to pass through the water if they wanted to continue their journey and I kind of secretly laughed to myself watching a woman who most probably thought she was alot better than many trying to wade through the water. While this theatre progressed we stood waiting for the local bus to Vrindavan while a pack of rickshaw drivers, harrassed us. “We are taking the local bus to Vrindavan!” we said and they laughed and said “There is no bus to Vrindavan.” We were getting mildly irritated “Yes there is, we took it yesterday!” They all burst out laughing like hyenas. We waited and waited and still no bus. Maybe they were right? We walked towards Vrindavan but the roads had turned to rivers of mud and eventually I told my boyfriend I couldn’t go on, I could walk yes, but trying to get across the mud was impossible. We agreed on the fare of the auto rickshaw to Vrindavan, this time the driver looked about 13 but I guess he was about 18, he had the best rickshaw, it was gleaming and new with different coloured disco lights inside. He looked at us in the mirror and switched on the sound system, it was western electro mixed with Indian pop and sounded exotic yet familiar, we laughed as he put the music on full blast and he began driving through Mathura like someone who was driving without brakes, in a vehicle spiralling out of control and it was both terrifying and very very brilliant. We raced by the little shops, people cooking infront of them, children playing, everyday India at the moment of dusk. These visuals with the music combined and the driver with a death wish made it a moment I will never forget, a moment I loved and never wanted to end, the music was so loud that people were looking, in all of the commotion I could see Indian boys and men looking at me with a “Wow, look at her!” and others just shouting “Oh my god!” in their funny accents. The driver would stop briefly along the way, in what looked like areas where rickshaw drivers park and made sure that the other drivers could see that he had us in the back. We felt like we may have been movie stars and grudingly stepped out of the rickshaw infront of our “hotel” in Vrindavan. I wanted to tell my boyfriend to ask him to come back this evening to drive us around town but knew it would all be lost in translation. This evening we wandered through our favorite place until now, the alleyways of Vrindavan. I never thought in a million years that India could be compared to Kyoto but in a distorted way it could. The veiled women from last night wore clothes just as elegant as the Geigi who wander around Gion, and the shops in the alleyways are all a feet or two above street level, they don’t have wooden floors but resemble white mattrasses where you have to take your shoes off and kneel on the floor while the shop keepers show you the goods, reminding you of the tea houses across Japan. My boyfriend bought some clothes, they are beautiful, the shop keeper laughed and said “Ah, you want fancy?” and brought out what could be tunics, beautifully embroidered. I can’t remember what they are called but he bought one in gold silk and another blue. They have white baggy trousers which may be called “dhoti” or something similar. We stopped off at the “hotel” where he put on the gold tunic and then we went out to eat, back to that place called “Foods” something or other. Later we wandered down to the Yamuna where we met a group of old men in western clothes smoking cannabis and they wanted to show us the “gold temple”, we had never heard of it, they took us through the streets only to abandon us along the way when they ran into another group of friends. We were lost but I spotted a water tower and knew we were near to the place we are staying, but still we couldn’t find it. We saw a group of about 20 police officers (or soldiers) and they all crowded around trying to understand where we are staying. We described that it is near a restaurant with glass doors which sold Chinese and South Indian food and eventually they figured it out. It turned out to be 3 km away! The police told the rickshaw driver to take us there for 30 rupee, the poor man looked heartbroken but we gave him a 100 when we got back to the area we recognize. We want to go to the Punjab and then onto the Himalayas, we have so much to see so tomorrow we will try and travel onto Amritsar via Delhi. 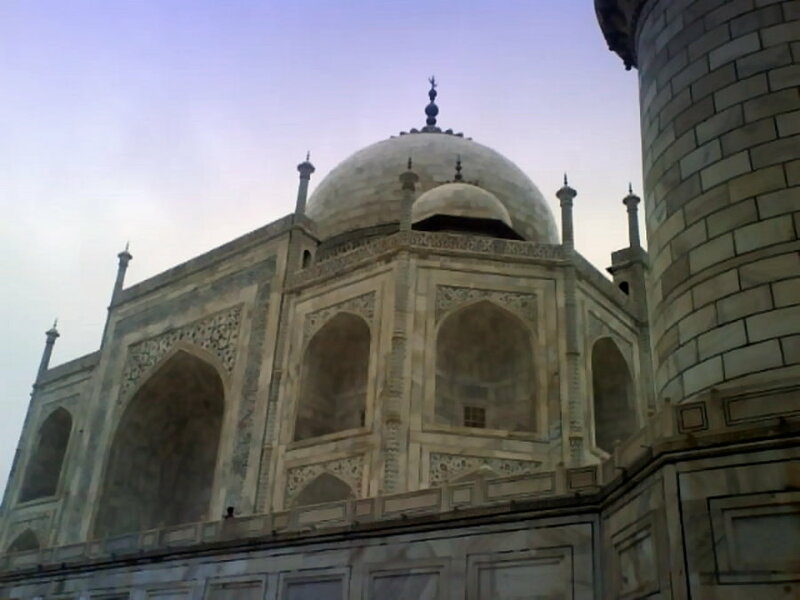 This entry was posted in India and tagged agra, shah jahan, taj mahal, uttar pradesh, vrindavan. Bookmark the permalink. I couldn’t help but smile at the way you have captured India. 🙂 Your anecdotes make reading your travel stories truly enjoyable. Glad to have discovered your blog! Thanks Cheryl it was six years ago I visited India but my memories are still so vivid, such wonderful people, truly a special country to me.